Are you planning a wedding, a corporate event, a milestone celebration such as a birthday, anniversary, or a bar/bat mitzvah? Or are you just looking for an exciting night or afternoon out? 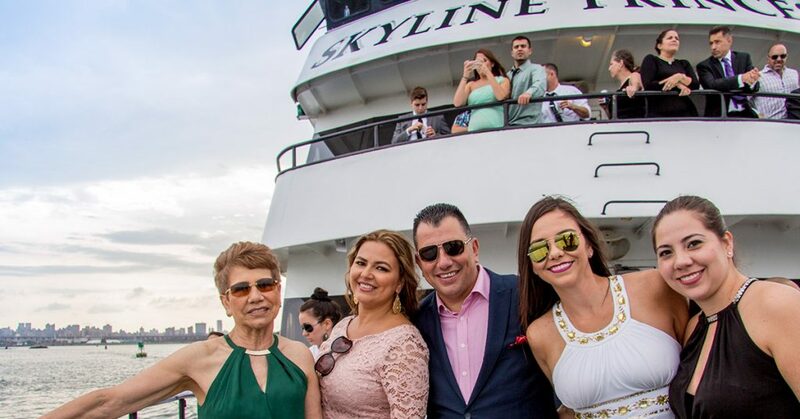 Whatever you’re planning, you can make it memorable with a Skyline Cruise. There are many reasons why Skyline is spectacular. When you board our 3-deck luxury yacht, the Skyline Princess, you will have a unique view of some of the world’s most famous sights as you’ll pass the Manhattan skyline. You’ll see the Empire State Building, One World Trade Center, the United Nations and Lady Liberty. But it isn’t just the sights that make Skyline the perfect venue for any event or outing. We want to tell you about all of the features of the Skyline Princess that has made us the tri-state area’s premier event venue. Skyline is in its 25th year of helping make events magical. All of our public cruises leave from our home port at the World’s Fair Marina, located at Flushing Meadow Park in Queens. We offer full ship charters from that location as well and you can also charter the Skyline Princess from many ports in the area, from Long Island and Connecticut in the east to New Jersey and Westchester County along the Hudson. As we mentioned, we’re the perfect venue for all types of events and if yours might not be big enough for a full-ship charter, Skyline will work with you. We often charter a private deck on one of the public cruises that leave from Flushing. Or we can set aside a table or two for something like a small wedding. We work with groups and families of all sizes. Just talk to our event planners about what you have in mind and get ready to cruise aboard the Skyline Princess. The Skyline Princess is climate controlled and we cruise in all types of weather. The ship is 120-feet long and 31 feet wide and it’s certified by the US Coast Guard to carry up to 450 passengers. We offer public lunch, brunch and dinner cruises as well as private ship charters. Our three levels give you enough room to make your event successful. For example, you can use the lower deck as a dining space and the middle deck for a business meeting or an activity like a casino theme. You can use one deck for your cocktail hour and another for dinner. The top deck of the Skyline Princess, known as the Skylight Deck, can be open air or fully enclosed. This level of the ship has a dance floor and a DJ space as well as a private bridal suite for weddings. There are outdoor viewing levels on all three decks of the ship and each level is equipped with a bar. The Skyline Princess has a galley, as our onboard chefs can prepare food for your event ranging from a casual cocktail party to a full buffet banquet. If you’re in charge of planning an event why not go to the best venue in the New York City area? Skyline can help you plan an event that you and your guests will never forget. Contact us today.